When I was planning for my trip to Chicago, I had was under the presumption that this city’s fine dining lunch is like New York – you have a lot of restaurants who would serve prix fixe menus. 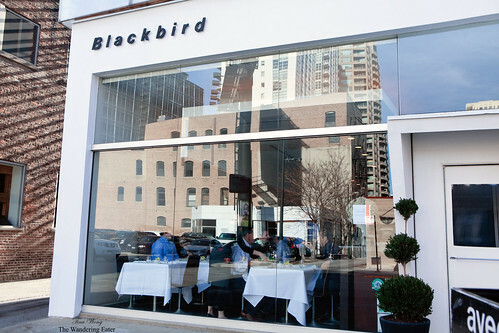 Except when I did my research, there’s barely any at all but the little glimmer of hope was Blackbird, a 1* Michelin restaurant and their Executive Chef Paul Kahan was nominated for the James Beard Award (2011). For that kind of esteem, I booked a reservation. 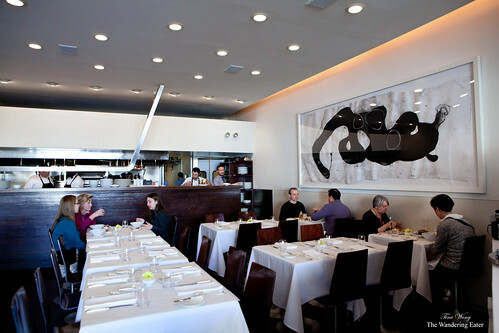 From the looks of this restaurant, it vaguely reminds me of The Modern in NYC. Streamlined, minimalist decor mainly of dark wood, white walls with a large abstract painting in the back, and peer out of large windows. Except at Blackbird you’re looking out at the semi-industrial street of W Randolph, instead of to MoMA‘s Sculpture Garden in NYC, and you see partially an open kitchen at the back of this dining room. The main dining pool here by the time I arrived are local businessmen and women from the nearby finance district who can take a leisurely pace of lunch. Our first courses were confit baby octopus with fennel, chestnuts, finger lime, and chilis and parnsip soup with compressed pear and house cured bacon. 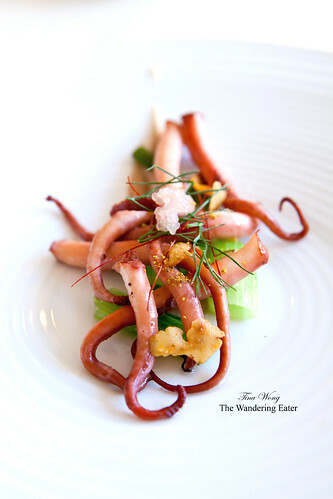 The octopus were slightly acidic, tender yet chewy tendrils of tentacles. The few dices of slightly crunchy chestnuts and the pungent anise flavor from the fennel. My companion’s parsnip was comforting to have from that somewhat chilly afternoon. 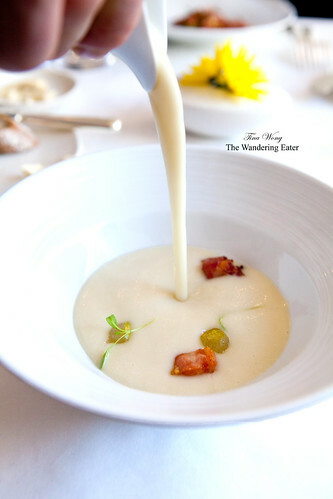 The delicious cubes of gently smoked house cured bacon worked very well with the relatively sweet parsnip soup and pear. The wood grilled sturgeon with chanterelles, kohlrabi, plums, Thai poppy jam and brown butter fish sauce was a bold flavored dish that had a lingering finish (if you can say that for food) on my palate. 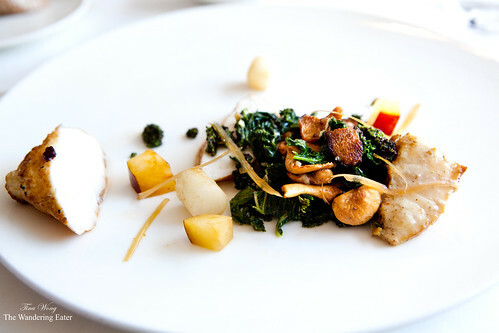 The meaty, smoky, salty fish matched the fragrant chanterelles, crispy fried kohlrabi leaves to the crunchy root itself. Then you have the sweet bites of plums to make it very intriguing. 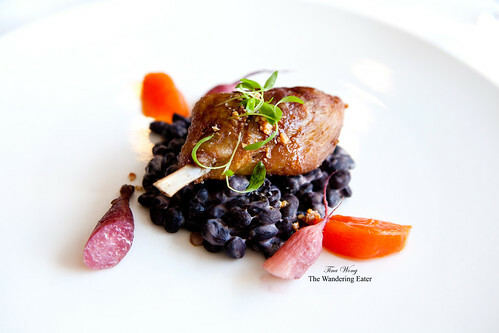 The confit duck leg with fuyu persimmon, red wine braised radishes, black beans, and sesame was not as good as the sturgeon. We both thought the duck was a bit overcooked and dry. The duck leg was first confitted then flash fried to get a wonderfully crisp skin probably explained why it was drier than preferred. The creamy black beans with the bites of crunchy radishes and sweet persimmon were good accompaniments but it doesn’t hide the issue with the duck unless there was a sauce. Desserts were overall pretty thoughtful. 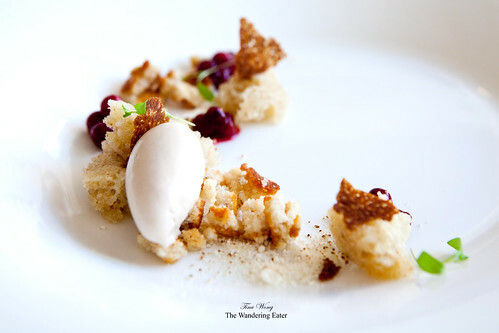 The favorite of the two we had was the steamed black walnut cake with ligonberries, toasted milk, cocoa nib ice cream. The coarsely cut chunks of moist walnut cake, very tart ligonberries which were toned down by the creamy, not too sweet ice cream. The bittersweet chocolate creameux with cashews, butternut squash and bergamot was a fine chocolate dessert but it didn’t appealed to me as much as the walnut cake. 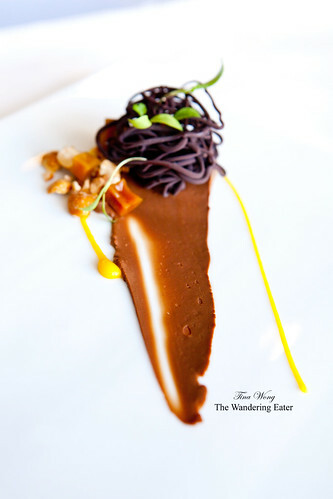 The creamy dark chocolate “noodles” had subtle notes of sweetness from the squash, crunchiness from the cashews and the subtle hint of bergamot was a nice touch. Overall, this was a very good, creative lunch for $22 per person. (They do have an a la carte menu available.) 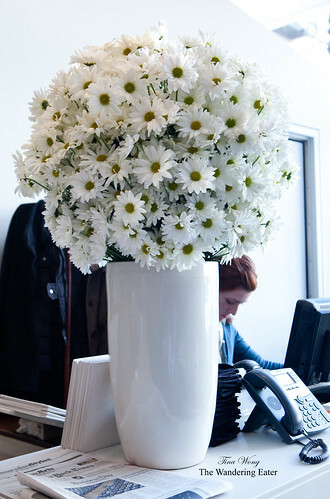 The servers were attentive, professional and friendly. From a tourist’s perspective, this restaurant is close to The Loop so I can cab it over in 7 minutes or so looking at Chicago’s Millennium Park making it easy to have a very good meal while being close to downtown.